Much has been written about the idea that Gallipoli heralded a new phase for Australia’s identity; about its symbolism and status as a historical turning point. Whatever the validity of this idea, at the core of it is a powerful notion of the ‘Anzac spirit’ – a potent image and an entrenched belief which continues to characterise commemorations to this day. During the war, a number of business owners recognised the power of this concept and exploited it for commercial purposes. Even with the introduction of legislation which prohibited use of the word ‘Anzac’, these businesses appropriated the idea of the Anzac soldier to create a sense that their products and brand somehow possessed the same qualities intrinsic to these men.1See Jo Hawkins, ‘Anzac for Sale: Consumer Culture, Regulation and the Shaping of a Legend 1915–21’, Australian Historical Studies, vol. 46, no. 1, 2015, pp. 7-26. On 22 July 1913 Hean’s trade marked their cough and cold remedy, Hean’s Essence, and began to use testimonials from serving members of Australia’s defence forces to promote their products from 1916.16Trade mark no. 15329, 22 July 1913, IP Australia via ATMOSS Master Sergeant P H Boag claimed he used the product and advises all his ‘comrades who catch cold to use Hean’s Essence without delay’.17‘Golds among our soldiers’, 24 June 1916, The Mirror of Australia, p. 4 Another advertisement stated an ‘epidemic of heavy colds’ was plaguing ‘our gallant soldiers’ and that Hean’s Essence was even warding off ‘attacks of the dreaded pneumonia’.18‘Coughs & Colds among our soldiers’, 1 April 1916, Cowra Free Press, p. 2 ‘A mother of soldiers’ Theresa Clune from Waverley said her sons Privates Francis and Jack Clune were ‘cured of heavy colds, contracted on their voyages from Gallipoli and America’.19‘Advertising’, 22 July 1916, Arrow, p. 3 The advert further asserted ‘thousands of Australian mothers’ were sending bottles of Hean’s Essence to ‘their soldier sons’. Would have hurt a “digger” hard. Heenzo trade mark, no. 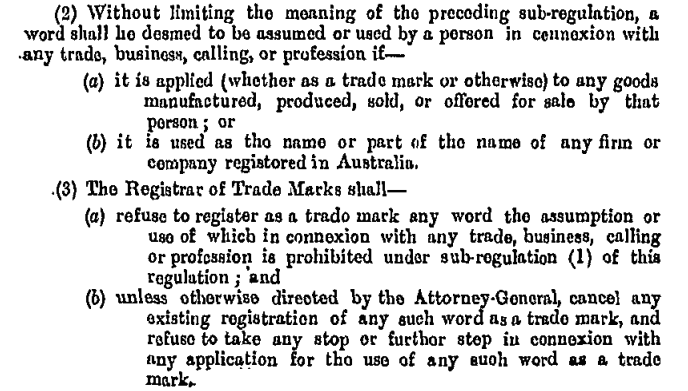 20657, registered 5 October 1916, IP Australia. As demonstrated in the later advertisements Hean’s began including more elaborate recommendations which included photographs of real-life AIF servicemen, as if turning them into informal ‘poster boys’. Underlying their endorsements was the message that Hean’s was contributing in its own way to the war effort. Indeed one of their notices dramatically declared the ‘effects of a bad cold are almost as much to be feared as the shot and shell of the enemy’.24‘Colds among our soldiers’, 23 August 1916, Sydney Sportsman, p. 6 So with the often deadly spread of diseases including the common cold and influenza being a daily part of life in the trenches, Heenzo cough remedy was, in effect, saving lives. 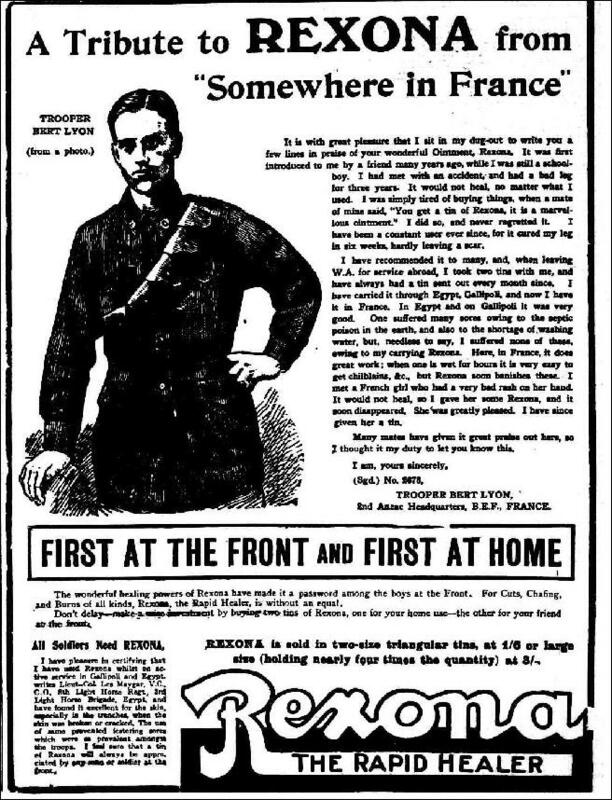 Advertisement for Rexona with a testimonial from ‘Trooper Bert Lyon’, 16 November 1918, The Advertiser, p. 13. Trove, National Library of Australia. These endorsements added a layer of credibility, as they did not just originate from a trustworthy source but also from the harshest of conditions. A group of AIF soldiers claimed they were ‘in the trenches in France…putting barbed out’ and requested ‘a few samples’ be sent.28‘Advertising’, 4 February 1918, The Sydney Morning Herald, p. 3 One Lieutenant-Corporal Brookes adds with a certain Anzac flair, ‘All Australians prove themselves when put to the test. So does Rexona’ and that after being ‘blown up’ by a mine at Gallipoli used Rapid Healer on his shrapnel wounds.29 ‘Advertising’, 4 February 1918, The Sydney Morning Herald, p. 3 In other advertisements, an artist drawing of ‘battle-scarred Anzac’ Bert Lyon of the 1st Battalion appears along with his appraisal which starts with: ‘It is with great pleasure that I sit in my dug-out to write to you a few lines in praise of your wonderful Ointment, Rexona’.30‘Advertising’, 16 November 1918, The Advertiser, p. 13 ; ‘Advertising’, 3 January 3 1917, The Register, p. 9 ; ‘Advertising’, 29 July 1918, The Advertiser, p. 6 He further notes that the conditions in the trenches often lead to ‘chilblains’ ‘but Rexona banishes these’. 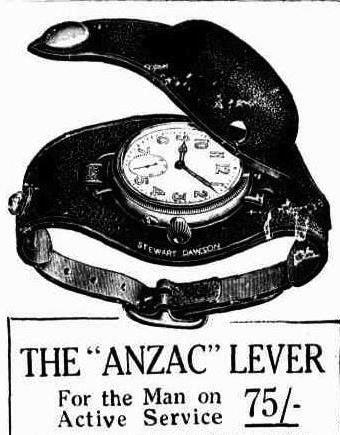 This use of the word ‘Anzac’ came to the attention of the Attorney General’s Department who objected to an ad in the Sydney Morning Herald in October 1917.36‘Advertising’, 27 October 1917, The Sydney Morning Herald, p. 20 The Crown Solicitor deemed that the advertisement was referring to an actual soldier of ANZAC and not the idea of Anzac, so no further action was taken.37Item 29/3484, Part 17, A432/86, National Archives of Australia via ‘‘ANZAC’ – a national heirloom’, Gallipoli and the Anzacs, Department of Veterans’ Affairs and Board of Studies NSW, 2010, accessed 25 March 2015 Maygar died of wounds received from a German aeroplane bombing in Palestine on 1 November 1917.38Mal Booth, ‘Records of the death of Maygar VC’, 11 October 2006, Australian War Memorial blog. 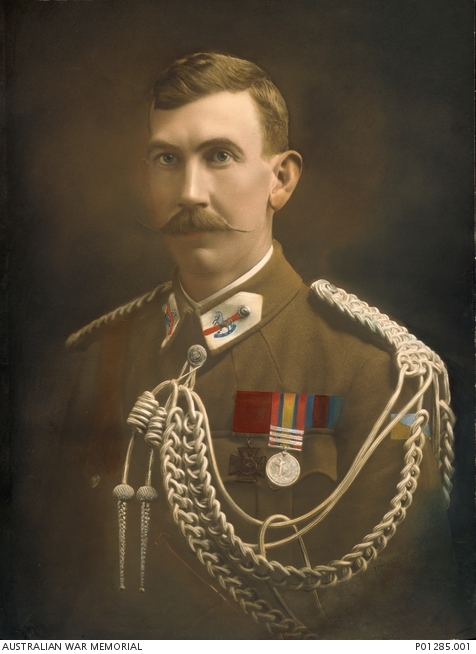 See also National Archives of Australia: B2455, MAYGAR LESLIE CECIL. 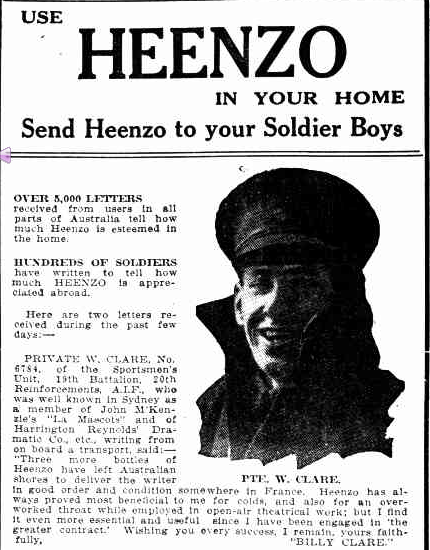 It is unclear whether there were any further objections as the advertisement continued to be published, even up to two years after his death.39‘Advertising’, 4 November 1919, Mornington Standard, p. 4 ; ‘Advertising’, 2 January 1919, Daily Herald, p. 4 In any case, the roundabout use of the word ‘Anzac’ and an endorsement from one of Australia’s most prominent senior officers was a clever strategy from Rexona. As historian Jo Hawkins concludes, the inclusion of a decorated soldier meant ‘the product was truly fit for heroes’.40Jo Hawkins, ‘Anzac for Sale: Consumer Culture, Regulation and the Shaping of a Legend 1915–21’, Australian Historical Studies, vol. 46, no. 1, 2015, p. 23. Communicated in the many trade marks registered and advertisements published during World War I, was the idea that the products on offer were integral to the war effort and that the brand behind them was unequivocally trustworthy. As they were endorsed by the likes of the country’s most reliable individuals of all, the brave men of Anzac, businesses were able to leverage this for commercial gain. In the business of product testimonials, who could be more credible and sincere than those men who were facing the most trying of circumstances? As with the early recognition and subsequent legal protection of this unshakeable idea of Anzac, it is clear brands like Wrigley’s, Hean’s and Rexona recognised the power of this source of approval for their consumers. This article was originally published by IP Australia as part of a project to investigate IP rights during World War I. Read the original article. Reproduced here courtesy of IP Australia. 1. ↑ See Jo Hawkins, ‘Anzac for Sale: Consumer Culture, Regulation and the Shaping of a Legend 1915–21’, Australian Historical Studies, vol. 46, no. 1, 2015, pp. 7-26. 38. ↑ Mal Booth, ‘Records of the death of Maygar VC’, 11 October 2006, Australian War Memorial blog. 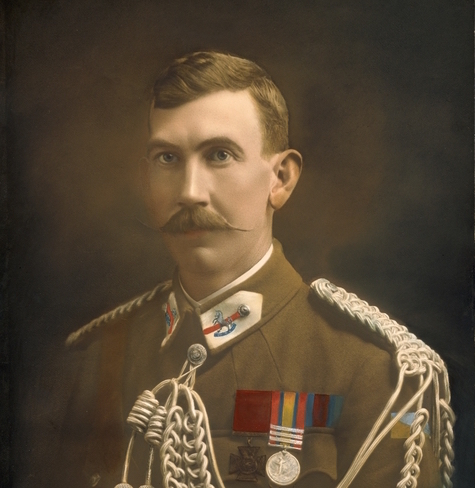 See also National Archives of Australia: B2455, MAYGAR LESLIE CECIL. 40. ↑ Jo Hawkins, ‘Anzac for Sale: Consumer Culture, Regulation and the Shaping of a Legend 1915–21’, Australian Historical Studies, vol. 46, no. 1, 2015, p. 23.